Over the last few weeks I have seen quite a few athletes who are leaving for college for their freshman year. Some are going to schools close to home here in Texas. Others are heading off to schools a long way from home in The Midwest, New England and the West Coast. I decided to re-post the article that follows because this is such an important time not just for athletes leaving home, but for any athlete, their family members, and friends. I feel that this is a very valuable and necessary topic. FAN Inc., The Foundation for Athletes in Need (www.faninc.org) is a non-profit organization that provides resources to former college athletes who were injured while participating in college athletics and are suffering in some significant way. I am grateful and blessed to be a member of the Board of Directors of this wonderful organization. Two weekends ago FAN Inc. had a board meeting and luncheon at the University of Michigan in Ann Arbor, Michigan. My wife Gisele and I attended. We were hosted by the University of Michigan Lettermans Club. They provided us their historic Lettermans Club Room at the University of Michigan golf course for our events. The University of Michigan catering department provided us with a wonderful lunch. The luncheon was an opportunity to tell many of those involved with athletics at Michigan about FAN Inc. and the vision those of us on the board share for this organization. I was asked to speak on the psychological impact of traumatic sports injuries. Other speakers were Brandi Winans on the impact of sports injuries on the family members of athletes who suffer severe injuries and Kurt David who spoke about the difficulty many athletes, especially injured athletes face transitioning out of their respective sport. I was profoundly moved by how the university and many former athletes took us in and treated us so warmly. Athletic Director Dave Brandon has written a letter of endorsement for FAN and the Letterman’s Club is excited to help out in any wathey can. I met alumni, students, coaches, a marketing specialist, faculty, and athletes who are all excited about the vision of FAN. The University of Michigan sets a very high priority on the well being and care of their student/athletes. Michigan has representatives who work closely with different teams to make sure that student athletes have the resources they need to have a successful college experience. If they need help with life skills, academics, nutrition, counseling, or any other facet of life they direct them to available resources. Their willingness to look out for the well being of their student athletes helped those we connected with see the value and the power of FAN Inc. It is clear that the mission of FAN Inc. is vital and important cause and will have a profound impact on the lives of those athletes we touch. The University of Michigan is a wonderful place. It was buzzing with energy about Saturdays showdown with rival Michigan State. Gisele and I arrived on campus for the game at 9:00am. We wanted see the campus and facilities and take in the energy on game day. We spent an hour and a half watching and listening to the Michigan band rehearse prior to the game. We attended the Michigan Football Lettermans Cornbread and Chili Outing prior to the game. Our view from the stadium pavilion allowed us to see both teams enter the stadium and watch the Michigan State band march in. I had tears in my eyes as I watched these rich traditions displayed by each school. 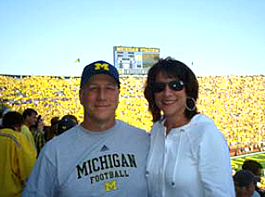 Attending a football game in “the Big House” has been on my “bucket list” for a long time. Walking into the massive bowl with brand new luxury suites was an amazing experience. I have never seen a stadium so big. And when it filled up there was a sea of maize as over 113,000 fans showed up to watch two ranked teams. 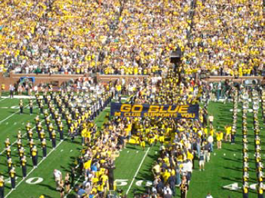 Seeing the players come out of the tunnel and touch the “Go Blue” banner was another moving experience. Michigan State won 34 to 17 after pulling away in the second half. The whole experience of the bands, passionate fans, a great game, and the rich traditions made this a memorable trip. Thanks This trip was a great kick off for the FAN Inc. vision. Looking down the road we see other universities from around the country, letterman’s associations, and professional athletes joining in and supporting this great cause. There are thousands of former college athletes out there suffering in some way and we want to help.